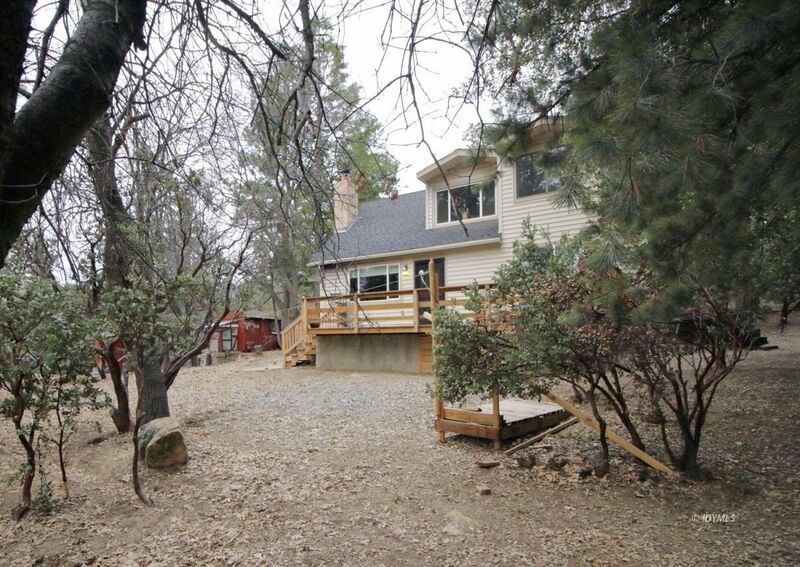 3 BR, 1.75 Bath located in secluded grove of Manzanita & Pine on just over 1/2 acre. Build deck off upstairs unfinished room & you will have unobstructed direct line view of Lily Rock. Remodeling includes: laminate flooring, granite countertops, window treatments, self closing cabinetry, Frigidaire Gallery appliances. New cast iron wood burning insert (with blower) along with a new central heating system. Mud room/laundry room with new Maytag washer/dryer & custom storage cabinet + a barn door to close off the breakfast nook for added warmth on chilly days. Breakfast nook with custom cabinetry & additional storage. 2 BR on main floor + .75 BA. Plumbing in bathroom, laundry, kitchen updated in 2017. Electric meter (county inspected) 200 amp with downstairs outlets/lighting 2017. All indoor/outdoor lighting has been upgraded & replaced. New fencing, carpeting stairway & upstairs BR. 2 Car Carport. 3 out buildings. Peek-a-boo views from upstairs. Property sold AS-IS.